This jacket player is in very good condition just not been used for a while. UNIT IS IN USED CONDITION. TESTED & WORKING. NICE ITEM IN ITS ORIGINAL BOX (NO POLY INSERTS). GOOD HIGH QUALITY VHS PLAYER / RECORDER. BATTERY COVER MISSING ON REMOTE. OVERALL NICE CONDITION. USED CONDITION. JVC VIDEO S-VHS Super VHS ET CASSETTE RECORDER - HR-S6855 - PAL / NTSC PLAYBACK . Condition is Used. Getting hard to find these Super vhs players now. Fully working tested (tested vhs did squeal a little when on fastest forwarding setting but only for a second. Thought it should be mentioned incase it happens again) just finished using this machine to transfer old family VHS tapes to DVD. Complete with remote and instructions. HiFi stereo. VHS video recorder. professionally maintained JVC 6-head VHS VCR to acquire. JVC 6-head VHS VCR. All devices provide optimum image quality, as one's is used by JVC video recorders. DVD recorder. JVC HR-XV3EK video cassette recorder & DVD player combi. Good used condition with only minor marks and signs of use (see photos) Tested and working, however, display on front doesn't seem to work. Fully working. missing bottom flip panel. Rest of the Word: We have an account with DHL so our prices are competitive. Manufactured in Germany, this VCR has 7 heads for optimal picture, audio, and editing performance. The TBC function is combined with the Digital Noise Reduction (DNR) feature to produce a picture that is clean as well as stable. JVC HR-J695EK VHS VCR Video Recorder Silver. PAL & NTSC Playback. NICAM DIGITAL STEREO Videoplus B.E.S.T Picture System. Tested in good working condition, unit has some light scratches/marks. Comes with JVC SCART Lead and UK Power Lead. Please note Remote Control NOT included, but basic functions can be performed from front of unit. JVC HR-J245VCR VHS Video Cassette Player/Recorder. The VCR has been checked and Plays / Fast Forwards / Rewinds etc. JVC HR-J210VCR VHS Video Cassette Player/Recorder. The VCR has been checked and Plays / Fast Forwards / Rewinds etc. £30: Rest of the World Russia. We have everything tested and checked before being advertised for sale. We will be responsible for all the loss. JVC HR-A630 VHS VIDEO PLAYER 4 HEAD NICAM PDC. QUALITY JVC ITEM MADE IN GERMANY. JVC VHS Player model HR-J425 very good condition for age. In good working order. Take a close look at the photos to ascertain the quality and condition of the item. Remote not included as seen. JVC HR-S6611 black SVHS video recorder. VHS video recorder. DVD recorder. DV/mini DV recorder. 6-head S-VHS video recorder (4 x video, 2 x audio). We see maintenance, thorough cleaning and inspection of all parts incl. 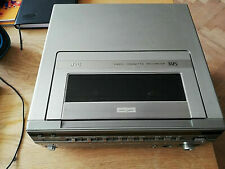 JVC HR V505EK VCR. Plays PAL and NTSC tapes. I have even original waranty. I never used it and it has no scratch even never been turned on. MODEL NO: JVC BR-S777U. USED GOOD CONDITION THE TOP COVER IS LOOSE BUT WORKS FINE. SVHS ET (SVHS recording on VHS cassettes). JVC HR-S7711 SVHS video recorder black. Slight traces of usage on the housing (product images are example images) . We see maintenance, thorough cleaning and inspection of all parts incl. JVC HR-S5960 SVHS video recorder. 6-head SVHS video recorder (4 x video, 2 x audio). VHS video recorder. DVD recorder. DV/mini DV recorder. We see maintenance, thorough cleaning and inspection of all parts incl. JVC HR-DVS1 MiniDV, SVHS recorder. VHS video recorder. DVD recorder. DV/mini DV recorder. Magnetic tape storage devices (VHS, beta, Hi8, Video8, MiniDV, MC etc.). Mini DV recorder. We see maintenance, thorough cleaning and inspection of all parts incl. JVC HR-S5970 SVHS video recorder. 6-head SVHS video recorder (4 x video, 2 x audio). VHS video recorder. DVD recorder. DV/mini DV recorder. We see maintenance, thorough cleaning and inspection of all parts incl. JVC VCR Video Cassette Recorder Player. JVC VCR Video Cassette Recorder Player in good working condition. Does not come with a remote but works fine without one. OTHER THAN THAT, THE ITEM IS IN GOOD CONDITION. MODEL NO: JVC BR-S7030UB. USED GOOD CONDITION THE TOP COVER IS LOOSE BUT WORKS FINE. Yesterday's technology is still for sale.... previous owned conditon - shows traces of use (scratches on housing) - tested & in good working order - brand: JVC - model: HR-J590EU - video system: PAL -DA4 (Double Azimuth) heads - A2/NICAM digital stereo - 24-hours display type -Euro AV1 audio/video input (scart) - Euro AV2 decoder input (scart) - ​​​​​​​RCA L/R audio connections - power: 220 - 240V AC, 50/60 Hz - antenna connection 75 Ohm - ​​​​​​​power consumption 12 Watt - dimensions 360 x 94.5 x 273 mm - color silver front and housing - net weight: 3.2 kg - comes with scart cable. JVC HR-S6955 VHS VCR Video Recorder player SUPER VHS SVH-S NICAM . In excellent condition and perfect working order. Comes with remote and 4 batteries, (2 for the remote and 2 spare) batteries are not new but are tested, fully charged and work great. Does not include manual or scart lead. Does include a coaxial cable. Any questions please feel free to ask, Thanks for viewing. VHS Recorder JVC BR-7030UB 3 IN ONE HI-FI VHS DUPLICATOR. UK MAINLAND ONLY. Condition is Used. Has been tested and working and is in excellent condition. Jvc, HR-XV31, vhs dvd combi player, . Condition is Used. Dispatched with eBay delivery – Shutl 2-3 days. Was working perfectly when the VCR failed. This is a quality JVC VHS video recorder, model HR-V705. It is in good, clean condition (with just a few minor scratches on the top) and full working order.